Update: 9/3/14 - Cladwell now creates a custom wardrobe for you in seconds. Take a 2 minute survey and you get "One list. All the clothes you need. Only the clothes you need." It's your personal roadmap to dress better. Perfect for the man who wants a new closet. My name is Eric, and I am not a stylish man. At least, that's what I would have said 6 months ago. Things are on the up. There's something about working for a fashion startup that has a tendency to impact your style. Go figure. The first day of wearing skinny jeans at home was interesting. My wife looked me over up and down, and then came her response: "Mmm hm." Gentleman, when your wife approves, this is a good thing. Here's a little context. My background is not in fashion. I've been working in the Internet Marketing/SEO industry for the past seven years, helping companies with their web marketing. I had also reached that American Dream we all hold so dear--working at home in my pajamas. I would say my style could be called business "very" casual. Since I worked in the financial services industry for a few years out of college, I was happy to shake free the tyranny and chains that had me wearing a suit every day. But, the at-home office combined with a change in weight (for the worse) and virtually a nonexistent clothing budget led to a pretty rough looking wardrobe. I didn't really like wearing anything I owned. When I started working with Cladwell in October, 2013, I knew that at some point, I'd have to step up my style game. At the same time, being authentic to myself was really important to me. I hate the idea of dressing out of pressure or for the sake of conformity, but I don't deny that appearance does matter. So, I was really excited to start getting custom recommendations from Cladwell. However, there was still one problem. I am incredibly CHEAP (as in "I've gone to 15+ Chic-fil-A Grand Openings to get meal coupons" cheap). I also hate shopping. At the time, Cladwell was still a paid subscription site. It wasn't expensive ($6.99 per month), but for a guy who has a super low budget for clothes, even $6.99 was too much. Knowing the product would be free in a few months, I decided to wait. Then, February 2014 came and the new, free version of Cladwell rolled out. I started to use the tool to get recommendations, but I still wasn't pulling the trigger on buying any new clothes. I liked the recommendations. I just didn't buy any of them. And then, something happened to finally move me to action. 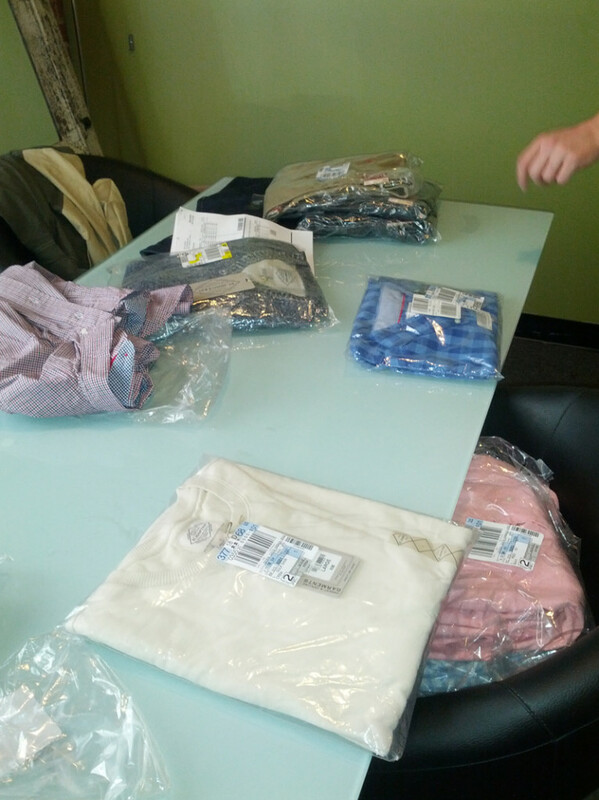 Cladwell's product isn't stopping with free, custom clothing recommendations for men. The idea from the very beginning was to serve as a guide for men, from start to finish, with their wardrobe. That's why we're working like mad to create and launch the Minimal Wardrobe feature for Cladwell. Essentially, what Cladwell will do for every man is create a customized checklist of clothing he needs for his unique life. From Black Tie to Fourth of July, and everything in between. Cladwell doesn't believe in perpetual shopping, or sending you a box of clothes every single month. We want every man to know exactly what items he needs for his wardrobe and how many. We then give him custom recommendations for each item, based on his unique style preferences, body type and budget. Once he acquires all of the right clothing items that help him feel confident, he's done! We think this is better for men, better for the environment and just better for the world. So, that's the Minimal Wardrobe idea. And I was able to preview the feature with an in-person session from our Fashion Director, Chris Merchich. But first, START YOUR CLOSET CLEANOUT HERE. The first step of the process began with a sit down interview with Chris - my own personal styling session. For a guy who's insecure about his clothing and appearance (I think a lot of guys live in this world), you would think that this could have been a pretty intimidating experience. But my fears were quickly put to ease. Chris has this very special and unique ability that all great expert service technicians have. It's an ability to uncover problem areas in a way that's not embarrassing. Instead, I was excited and filled with hope at the end of the experience, because in the hands of this expert, I had the guide I so desperately needed. The questions of the interview were fairly standard. Here's a sample of what was asked. Describe your work life. Describe your social life. What would you say are your current issues or problems regarding your clothes? What do you have in your closet that you love to wear? How do you want to feel when you get dressed for the day? When people see you and the way you're dressed, what do you want them to think about? What do you want to communicate? What I've found fascinating about not only my interview, but other peoples' responses to questions like these is how "personal" clothing is to everyone. Everyone has a story about what they wear and why they wear it. Everyone has been shaped in some way by their experiences and the stories around them. Over time, these stories reflect themselves in what we wear. These questions didn't just reveal a lot about my clothing. They revealed a lot about me. To see the entire list of questions and answers, you can click here. The next step was Chris taking these answers and assimilating them into a personalized wardrobe plan for me. a) Someone who actually knows me and who has fashion expertise is creating a customized plan based on my needs, wants and budget. Frickin' sweet. b) The possibility of actually improving my wardrobe and liking the clothes I would wear was imminent. My style is not something I had considered much or put any effort into for several years (let's get real, it started being ignored once I got married). My clothes consisted of free t-shirts and the occasional gift. Years of closet neglect were about to be addressed head on. When Chris had finished my plan, we set up a meeting together for the presentation. Based on the answers to the interview questions, he created a spreadsheet with a personalized plan of action. It was pretty simple. Based on my answers, it said you need "x" many jeans, casual button shirts, casual blazers, boots, accessories, etc. Each category was broken down with the amount of items I needed, along with a link to a specific product that was hand picked for me. And based on my lifestyle, the total number of items I needed was 35. (Interesting fact on this number is that we later ran my answers through Cladwell's algorithm, and it came up with an identical number of items for my Cladwell generated checklist). I had given a budget of $1,000 (I told you, I am cheap!). My personalized Minimal Wardrobe plan came to a total of $1,428 - a $40.80 average per item. When I received the list, something clicked. We looked at several of the items together, and Chris explained why he thought each was good for me. The list was primarily built for a "Casual Guy" style personality, but with a few items that might stretch me a bit in terms of fashionability. I was able to ask questions, and it was helpful to understand the "why" behind his selections. It was also very encouraging to have an fashion expert say, "I think you'd look great in this." And while Chris was amazing, the big "aha" for me was this list itself. It was in a simple, Google Doc format. So, nothing fancy. However, seeing my interview responses turned into a customized, well thought through and expert generated plan is what motivated me to action. It was the first time in my 6 months of working with Cladwell that I felt like I was ready to make some clothing changes. Up until this time, I was paralyzed in making any clothing purchases, because I had no context for how they would work with my entire closet. I would just be buying clothes aimlessly with no end in site. Now, I had a guide. A roadmap. And a finish line. $1,400 is a good chunk of change for my family's budget (remember, I'm a father of 2 and the cheapskate shopper). But for a little over $100 a month for the next year, I could have an entirely new wardrobe that I felt great in. That's a budget I was willing to spend. I just needed the right tool in my hands. Now I had it, and this is what happened next. Wardrobe checklist in hand, I was free to do something that was long overdue... purge my closet! There were items in this closet that were long overdue to go, as you can see. About 2 years ago, I experimented with an aggressive weight training program called Starting Strength. Beside damaging by back, I also gained 32 pounds in around 3 weeks. Yes, you read that right--inspired by this eating plan. I've shed a lot of that weight since then, but one thing was for sure, there were a lot of items in my closet that didn't fit. If I don't love or feel confident wearing it, then it's time to get rid of it. Goodbye 50+ items! Here's a look at the closet after. I still hung onto some items that I don't love or wear often (see the multiple sports jerseys), but it was a good start. Next stop? You guessed it. Goodwill. There they go. Two very full garbage bags worth. It wasn't all easy. I got rid of some sentimental items that go way back and tell a story. But it had to be done. Like a band-aid, right off. And once gone, it felt great!!! In fact, I'm pretty sure I could go back and get 20+ more items out of the closet. No more wearing clothes that I don't feel confident wearing. Next thought? "Oh crap! Now, I need stuff to wear! I'm actually going to have to ... shop!" My last shopping experience was horrible... and I wrote about it. It contained nearly every reason of why men hate clothes shopping. But this time will be different, right? Right. At least, I hope so. I began my looking over the Minimal Wardrobe list Chris built for me. Being the notoriously frugal man that I am, my mind immediately began to think through how I could cut down on the overall cost. 1) Buy from the same store to save on shipping 2) Buy clearance items from last season. Currently, Cladwell's recommendations give you referral links where you checkout on retail sites. The advantage is that Cladwell recommends from thousands of different of items. The downside is that there's a good chance you will have to checkout on multiple websites--entering CC info and adhering to multiple shipping/return policies. The Product Team is furiously working through how we can resolve this in the future, and I think we have a good beat on it. But, I had to buy now. So, I reviewed my list and noticed that several of my recommendations were from J.C. Penney. That's where I began. Will it fit? Fit is obviously an issue when buying online. I just determined to buy multiple sizes (especially with pants) and know that I would have to do some returns. Once I knew I was going to return items, I was free to shop for other items that weren't on my list, but thought it would be worth trying on. I easily passed the free shipping threshold ($100), and this also made it easier to buy more items. Again, thinking I'd return anything I didn't love. I started with the recommendations from Chris, but armed with my insights from him and my Cladwell Style Analytics, I felt empowered to buy and try on some items that weren't on the list. I stumbled into Winter Clearance deals and found some amazing prices - $10 button ups, $12 jeans, $6 sweaters. Yes please. The process still took longer than I wanted, about 2 hours. I consistently found myself wishing the Cladwell engine existed on J.C. Penney's website, so that I could quickly and easily find items I would love within their clearance section. I was pleased to find a coupon code on the site that helped me save an additional 15%. Here's a few of the items I shopped for. I was a sucker for the recommended items on clearance and bought a few that weren't on my list. But again, I was thinking why not? I'm already going to do returns. I already have free shipping. Why not buy a lot of items and only keep the items I LOVE! Loved this jacket for $25. This was one recommended by Chris. My wife loves it too. The online coupon code saved me $72. The most expensive item was a Cladwell recommended jacket for $125. Sum total for my first purchase was 26 items for $433, which came out to $16.65 per item. About a week later, it showed up at my door looking like this. Let's just say... J.C. Penney doesn't have the same packing standards as Amazon. But, I was excited to try everything on! Next, came a perk of working with Cladwell. Instead of trying on the clothes at home and not knowing what looked great from a fit or color standpoint, I was able to try on all of my purchases and get feedback from Chris and our two fashion interns, Erika and Brittany. Our board room turned into a makeshift dressing room. Chris helped me rifle through the packaging and was able to give excellent feedback on fit and the quality of items. The key for me in trying on the clothes was having the mindset that I was only going to keep what I loved and felt great wearing. This is what a guy who is not used to trying on skinny jeans looks like. With each outfit, I'd walk into the other room and get feedback from the girls. Always nice to get someone else's opinion. And if we both were excited about the item, I kept it. This casual sweatshirt was $6 on clearance. It wasn't one of my recommendations, but I did have 2 casual sweatshirts on my list. This one got good feedback, and it was $6 bucks! Done. Plus, I got to be twinsies with Brittany for the day. See how excited she is? This blue shirt ended up being my favorite of the bunch. Again, none of the recommendations on my checklist for casual button up shirts were to J.C. Penney, but my the list did say I needed 4 casual button up shirts. So, to save some time and money on shipping, I shopped on J.C. Penney while I was there. The list gave me a starting point where I was confident enough to try buying something I thought I might like. If I didn't like it, no worries. Just return it with the other items. I also had a pretty major discovery around fit. I found that the G.H. Bass & Co. shirts were designed for me. The one below is actually a Stafford, but I ended up keeping 3 G.H. Bass & Co. shirts. Here's a summary of my first crack at shopping towards my checklist. Since none of the jeans fit in the first go round, I knew I was going to make another purchase. The waist was a good fit, but I was off on the length. Easy solve. And these Arizona jeans were $12, so I didn't want to pass on the deal. Since I was on the J.C. Penney site again, I went through a similar routine. I bought enough to get free shipping, and used a coupon code again. I also decided to knock off a different category on my checklist - t-shirts. My checklist recommended v-necks from Target. So, I figured a J.C. Penney v-neck is as good as a Target v-neck. Here's a look at what I kept from my second purchase. The coat you see on the left was another pivot. I LOVED the recommendation Chris gave me on this jacket, but the sleeves were a bit too long, and it was $125. On my second purchase, I was able to score this grey coat I liked nearly as much for $30. Everything I didn't keep from Rounds 1 & 2 of shopping, I threw in a box and drove 15 minutes to the nearest mall. The returns process was much easier than I anticipated, and this guy, Justin, was a champ and had me out of there in about 10 minutes. Does Cladwell work? Yes, Cladwell rocks!! !Ok, this isn't a completely biased review. I work at Cladwell. But it's true! I live in Cincinnati. I root for the Reds, eat my chili, and up until recently wore only t-shirts, hoodies and other comfortable clothes that don't fit well. But, the Minimal Wardrobe from Cladwell was enough to motivate a cheap man who cares very little about fashion to work on his wardrobe and up his style game. Cladwell is perfect for the guy who wants to look good, but needs some expert help. It's fast, easy, customized and removes the hassles of shopping. I can't wait for more men to experience the benefits of the Minimal Wardrobe checklist. I'm not a guy who follows trends. I'm not a guy who likes to shop. I also don't find my identity in my appearance. But I'll be honest, receiving compliments from my wife on a regular basis has felt great. And it has happened consistently. She has a group of friends that meets in our home every Tuesday, and she's been showing me off on more than one occasion. It's motivated me to keep going on this style journey. It has given me a boost of confidence, with very little cost or effort. Now, I know I don't have to be intimidated by the process, and I am excited to create an entire wardrobe that I love for every season. With Cladwell, I now have a tool that equips me to navigate the often scary and confusing world of clothing and makes it easy to look my best.